A studio art major, member of the Colgate Thirteen, and president of the Brothers student organization, David (D.J.) Jordan ’17, of Brooklyn, N.Y. is not only an impressive student, he’s also a bit of a YouTube star. With more than 9.2 million views and 17,000 subscribers to his PilotTails YouTube page, Jordan has created a cult following of his hand-made, stop-motion homages to all things anime and gaming. Calling Jordan’s animations painstaking labors of love would be an understatement. His 18-minute and 28-second stop-motion opus, Super Saiyans vs. Super Hedgehogs 2, is comprised of 16,620 individual frames (15 per second) in which action figures from the animated series Dragon Ball Z and Sonic the Hedgehog square off in battle. When the frames are played quickly in succession, much like a flip book, the illusion of movement is created. The special effects in that video were the result of a collaboration with Zylladys Live FX, a YouTuber from Brazil named Guilherme Fernandes, whom Jordan met online as a result of posting his videos. 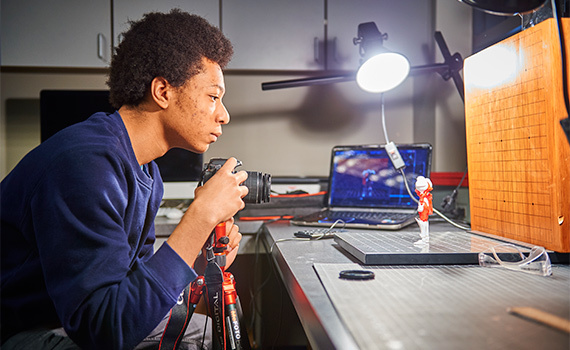 Jordan first started experimenting with stop-motion photography as a Prep for Prep high-school student in his dorm room at Phillips Academy in Andover, Mass. “Now there’s a lot more polish that goes into the animation. It’s not just knowing how figures work, but how motion works with momentum and the things you don’t see with the naked eye,” Jordan said, adding that his classroom experience with Wenhua Shi, assistant professor of art and art history, has helped improve the quality of his work. After new 3D printers were installed in Case Library last year, Jordan immediately took advantage of the campus resource, designing and printing out individual action figure parts to assemble into a fully-articulated model of Samus Aran, heroine of the Metroid video game series, that he promptly used in a screen test battle with a 3D-printed Link from Zelda. Stop motion isn’t new. The original 1933 King Kong was animated in large part thanks to the technique, and Ray Harryhausen’s creations in Jason and the Argonauts (1963), and Clash of the Titans (1983) made the effect world famous. Today, films like Tim Burton’s The Nightmare Before Christmas (1993), and the claymation of Wallace and Gromit and Shaun the Sheep continue the stop-motion tradition. With two influential internships now under his belt, one at the New York City architecture firm Diller Scofidio and Renfro, and another with The Foundation Center, a nonprofit organization where he helped develop computer animations, Jordan says he clearly sees how he may apply his skills to a career after college either working in animation or architecture.